Home » NewMusicBox » What does it mean to be American? This post was originally written for the Salastina Music Society, ahead of their premiere of Derrick Spiva Jr.’s American Mirror String Quartet on October 7, 2017. The text has been reworked with the assistance of Kim Nguyen Tran for NewMusicBox and reposted with permission, along with a video of the performance. The original post can be found here. A few months ago, I was getting ready for an international trip. I had lots of preparing to do. For anyone who has traveled internationally, we all know that immunizations can be a huge part of the process, depending on which country you plan to visit. In this case, I am a classical composer who often integrates musical practices from around the world into my work, and I was going to Ghana—an amazing country in West Africa—to continue my studies in traditional Ghanaian music and culture. 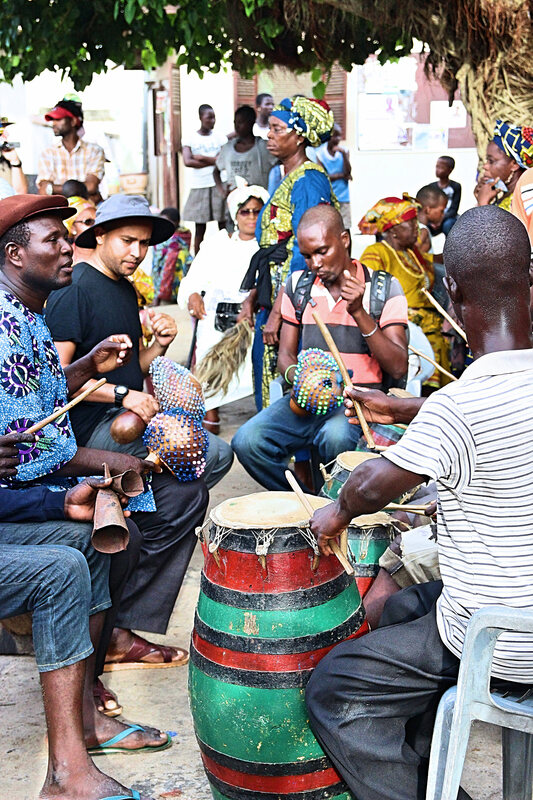 Derrick Spiva Jr. (in grey hat) playing axatse (shaker) with an Ewe music ensemble in Anyako, Ghana, hometown of the Ladzekpo family. July 2017. One of the most important immunizations required for entry into Ghana was the yellow fever shot. I had received all of my other immunizations, but this one was in short supply globally, so I had to go to one of only two places in Los Angeles that provided it. When I arrived at the clinic, I filled out all of my paperwork and waited to be called in. The travel clinic was decorated with some lovely paintings and other pieces of art from around the world. How beautiful, I thought. When I was called in to receive my immunization, I couldn’t help but strike up a conversation with the nurse who was administering the shot. While looking at my American passport, she asked me where I was from. 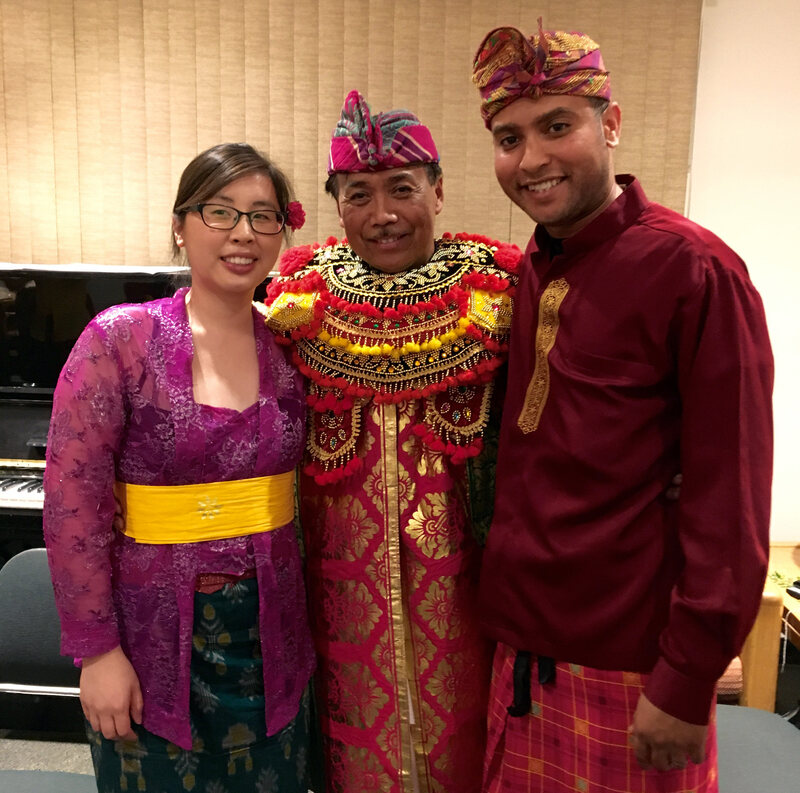 I thought to myself, I know a few people from Bali who live in Los Angeles, and I absolutely love playing Balinese gamelan with them at UCLA on Tuesday nights! Derrick Spiva Jr. (right) and his wife Kim Nguyen Tran (left) with their Balinese gamelan gong kebyar teacher, I Nyoman Wenten (center), after a performance in 2016. But I don’t have any linguistic roots in Bali. If anything, I would have a slight accent from the American South, seeing as my grandparents grew up in Tennessee and Texas. I’m not sure how I would even fake a Balinese accent while speaking English, without first doing some intensive research and rehearsal. Beyond that: what accent is considered the American accent, anyway? Aren’t there are multiple dialects of English throughout all 50 states? Needless to say, there was some identity confusion taking place. As an American who is a descendant of slaves, I don’t have a complete picture of exactly who my ancestors are. But I am going to claim who I am, nonetheless. My American identity is shaping up to be the result of the absorption of many different coexisting cultures. As an American who is a descendant of slaves, I don’t have a complete picture of exactly who my ancestors are. But I am going to claim who I am, nonetheless, as a member of my community, here in America, here in Los Angeles. Like many people living in this sprawling metropolis, my American identity is shaping up to be the result of the absorption of many different coexisting cultures. I’ve been mistaken as not being an American before, and I know this experience is shared by many others who live in our country. Sometimes it is as simple as a misunderstanding in an immunization clinic. At other times, it can be downright abusive, as it is used as a tactic to separate individuals from a group by using religion, race, sexual orientation, and/or gender to isolate them. It is a scenario that I have seen play out at every level of our society, including debates about the Americanness of a president of the United States. And not just with Barack Obama. John F. Kennedy’s loyalty to the United States was questioned because of his Catholic religion. Does classical music have something meaningful to say in this conversation about being American? The answers to these questions seem to continuously morph and unfold over time, just as the social experiment that is our country seems to do the same. I decided to write a string quartet (titled American Mirror) that I hoped would shed light on the America that I have experienced. Despite what its reputation might be, classical music—especially contemporary classical—is amazingly open as a musical form. Classical music is one of the most flexible genres in its ability to accept a wide variety of sounds into its sonic world. Take a look at this list here. It’s incredible that all of these diverse pieces fall within the classical music genre. Classical music has an ability to open itself up to different sounds, instruments, cultures, genres, and perspectives. Despite this openness, sociological, economic, and historical factors have excluded large groups of people from participating fully in classical music. I have struggled to find my place in the classical music world at times, also. I have always been drawn to the porousness of classical music, it’s ability to accept limitless sounds and concepts into its sonic world. But in my classical music education, I did not always see this openness highlighted. I found myself being deeply drawn into other musical traditions that resonated with me in ways just as profound, yet different, from the ways that classical music resonated with me. Some of the musical traditions that have most influenced my classical compositions are traditional Ghanaian music, Hindustani and Carnatic Indian classical music, Eastern European folk music (particularly from Bulgaria), and American folk traditions (gospel, hymns, jazz, bluegrass). In order to engage with these different musical traditions in a meaningful way, I realized early on that I needed to continuously accept the humbling fact that there was so much I did not know. When hearing live Ghanaian music for the first time, I was overwhelmed by the many layers of polyrhythms and timbres. It felt as if I was riding an avalanche of rhythms thundering with joy. It took months of listening, practicing, and performing for me to even begin to understand the complex structures and relationships between the instruments, vocal songs, and dancing of this tradition. I want the classical music community to experience this kind of access to music, where the audience feels that they are part of the music-making process. I also want the classical community to experience the beautiful close harmonies and melodic ornamentations of Bulgarian women’s choir singing; the rhythmic complexities of Hindustani and Carnatic Indian classical music; and the profound stories of historical struggle and redemption that are present in the sounds of American folk traditions. My compositions strive to integrate these concepts and aesthetics into a cohesive and expressive musical language, in a classical music setting. I reach for the possibility that people in the audience, no matter what their background, might be able to hear themselves reflected somehow in the music—whether it be a reference to a folk tune from their homeland, a lullaby a parent sung to them as a child, or a rhythm that makes them want to get up and dance. My string quartet American Mirror is a sonic reflection of my community here in Los Angeles. The music reflects what I see, hear, and live with in my everyday life as an American in this beautiful City of Angels. Melodically, the piece draws from gospel, West African, North African, and Eastern European vocal techniques. Underneath these melodies, American Mirror uses Copland-esque open harmonies not only found in Appalachian folk music, but also many other folk musics from around the world. There is also some audience participation built into the piece in the form of humming a drone (perfect fifth) to support the musicians and keeping tala (Hindustani and Carnatic rhythmic cycles) in the traditional way by clapping and waving. Finding a way for all of these musical traditions to exist together in a cohesive, integrated way has taken a lot of time and effort, through performing, researching, and trying to locate and understand the points of overlap that exist between the styles. I found that vocal lines, certain rhythmic cycles, and the embodiment of rhythm through movement were particularly important points of connection. It sometimes felt like playing that old video game Tetris, in which shapes have to be layered as efficiently as possible in a given amount of time. The most amazing thing to me is that there are so many wonderful interconnections between what at first seem to be very different musical cultures. When you understand and empathize with someone (and maybe enjoy their music), it makes it awfully difficult to hate. Writing American Mirror was very emotional for me at times. A slow section in the middle of Part II was especially difficult. The section begins with solo viola, playing a very vocal melody inspired by the humming of folk tunes, a phenomenon that occurs in many cultures across the globe. Gradually, the other instruments join the humming viola, with their own versions of the humming. When it comes down to it, when everything is taken from us (property, technological gadgets, finances), we still have our own voices. Without anything else, we can tell stories, mourn, express infinite things through just our voice. While I was writing this section, my thoughts were with members of our community who have not been able to feel the sense of belonging that we all yearn for. Many of us know what it is to feel like an outsider in our own communities. One of the main purposes in writing American Mirror was to represent my identity musically, by weaving together my favorite moments of awesomeness in musical cultures that resonate strongly with me and sharing this with the classical music community. It’s important to understand that each of the individual musical practices that I have brought into the piece are amazing, uplifting, and transformative in their own right, and certainly don’t need my work to shine. But I hope my music can be a doorway for people to learn about musical cultures that they are not yet familiar with. As I continue to find points of overlap between the musical cultures that I practice, it is becoming clear to me that music has the ability to serve as a model for how we can find points of common ground in our society at large. The shared experience of music can be a profound vehicle through which people come to understand one another, despite different backgrounds and perspectives. When you understand and empathize with someone (and maybe enjoy their music), it makes it awfully difficult to hate. November 14, 2017 at 8:03 AM What Makes Music Matter?